You should rev up your eBay bidding strategy during the final 24 hours of an auction and decide, once and for all, whether you really have to have the item you’ve been eyeing. Maybe you put in a maximum bid of $45.02 earlier in the week. Now’s the time to decide whether you’re willing to go as high as $50.02. Maybe $56.03? No one wants to spend the day in front of the computer (ask almost anyone who does). You can camp out by the refrigerator or at your desk or wherever you want to be. Just place a sticky note where you’re likely to see it, reminding you of the exact time the auction ends. If you’re not going to be near a computer when the auction closes, you can also use an automatic bidding site to bid for you. With a half-hour left before the auction becomes ancient history, head for the computer and dig in for the last battle of the bidding war. Log on to eBay about five to ten minutes before the auction ends. The last thing you want to have happen is to get caught in Internet gridlock and not get access to the website. Go to the item you’re watching and click the auction title. With an hour to go, if your auction has a lot of action, eBay reloads the bidding action every second so you can get the most current info on what people are bidding. 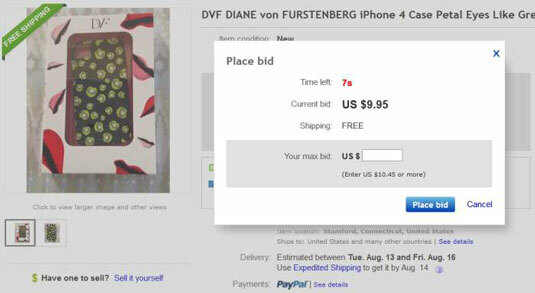 The rapid-fire, final flurry of bidding is called sniping — the fine art of waiting until the very last seconds of an eBay auction and then outbidding the current high bidder just in time. Of course, you have to expect that the current high bidder is probably sniping back. With a hot item, open a second window on your browser (in Internet Explorer or Firefox, you do that by pressing the Ctrl key and the N key together); keep one open for bidding and the other open to watch eBay’s constant reloading during the final few minutes. With the countdown at 60 seconds or less, make your final bid at the absolute highest amount you will pay for the item. The longer you can hold off — down to around 15 seconds — the better. It all depends on the speed of your Internet connection (and how strong your stomach is), so practice on some small auctions so you know how much time to allow when you’re bidding on your prize item. Keep watching the time tick to the end of the auction. If you want to be truly fancy, you can open a third window for bidding and have a backup high bid in case you catch another sniper swooping in on your item immediately after your first snipe. You can avoid the third-window routine if you’ve bid your highest bid with the first snipe. Then if you’re outbid, you know that the item went for more than you were willing to pay. Some eBay members consider the practice of sniping highly unseemly and uncivilized — it’s like when dozens of parents used to mob the department store clerks to get to the handful of Beanie Babies that were just delivered. Of course, sometimes a little uncivilized behavior can be a hoot. Sniping is an addictive, fun part of life on eBay auctions. And it’s a blast. You’re likely to benefit from the results of sniping and enjoy your eBay experience even more — especially if you’re an adrenaline junkie. Know how high you’re willing to go. If you know you’re facing a lot of competition, figure out your highest bid to the penny. You should have already researched the item and know its value at this point. Raise your bid only to the level where you’re sure that you’re getting a good return on your investment; don’t go overboard. Certainly, if the item has some emotional value to you and you just have to have it, bid as high as you want (and can afford — but you knew that). But remember, you’ll have to pay the piper later. You win it, you own it! Know the speed of your Internet connection. Remember, this is a game, and sometimes it’s a game of chance, so don’t lose heart if you lose the auction. Although sellers love sniping because it drives up prices and bidders love it because it’s fun, a sniper can ruin a week’s careful work on an auction strategy. The most skillful snipers sneak in a bid so close to the end of the auction that you have no chance to counterbid, which means you lose. Losing too often, especially to the same sniper, can be a drag. If your Internet connection is slower than most, and you want to do some sniping, make your final bid 2 minutes before the auction ends — and adjust the amount of the bid as high as you feel comfortable with so you can beat out the competition. If you can make the highest bid with less than 20 seconds left, you most likely will win. With so many bids coming in the final seconds, your bid might be the last one that eBay records. This stuff is supposed to be fun, so don’t lose perspective. If you can’t afford an item, don’t get caught up in a bidding war. Otherwise the only person who wins is the seller. If you’re losing sleep, barking at your cat, or biting your nails over an item, it’s time to rethink what you’re doing.